Options Tuna Flavor - 2.1 oz. Chicken Flavor - 2.1 oz. 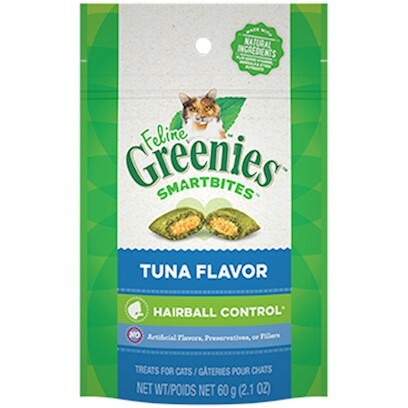 FELINE GREENIES SMARTBITES Treats offer breakthrough functionality in an irresistible treat. These "smart treats" are not indulgent empty calories. SMARTBITES Treats contain natural ingredients that provide real health benefits. Cats need a balance of fibers to help minimize the formation of hairballs in their digestive tract. In our FIBERBLEND Formula, a combination of plant-based fibers helps minimize hairball formation and promote healthy digestion. For use in cats only. Feline Greenies Smartbites Hairball Control Cat Treats are formulated for cats one year of age or older. For a healthy hairball benefit, feed 12 treats all at once daily. As with any treat, adjust the amount of main meal to compensate for calories delivered by treats. Always monitor your pet while feeding a treat. Provide fresh drinking water at all times. See your veterinarian regularly. To help maintain freshness, we recommend sealing the bag tightly and storing in a cool, dry location.